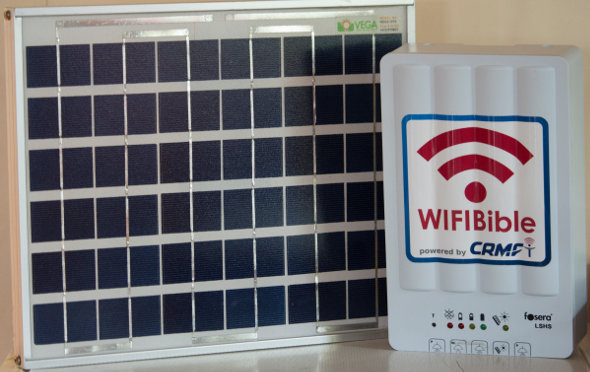 The Solar WIFIBible device is another of the WIFIBible models that CRMF developed. It consists of a small 12 volts WIFIBible device, built into the battery box of a solar kit. It is powered by the battery box which gets its power source from a 15 watts solar panel. CRMF have built twenty of these models for remote areas with no access to power or electricity. These models are not sold, but loaned out to people. Before installing these devices, people come to us and fill out forms to recommend a location for us to go and install. This form requires people to point out locations where people commonly hang out, gather, or pass by. From that feedback we pick out a location and go and install it. 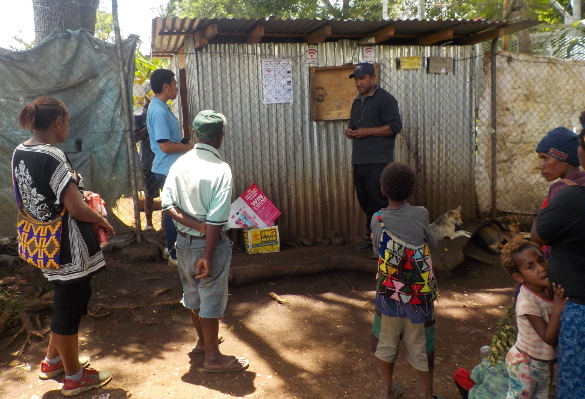 The first installation was with one of our own staff member Nicholas Jowapo, at his village, Nalepa. 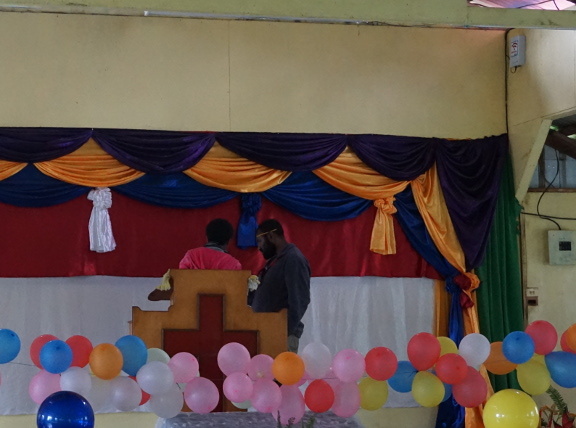 He is also a pastor at the CLC church in the village which is located outside of Goroka town. He had recommended his sister’s trade store for the solar WIFIBible install. During the installation a small crowd gathered around the trade store to watch. After that we talked to them about the WIFIBible and showed them how to get free biblical content from it. That Sunday, Pastor Nicholas made an announcement about the device to his congregation and encouraged them to go to his sister’s trade store and download free biblical contents to their mobile devices. The second installation was at a Foursquare Gospel Church at Wantrifu village in Asaro valley, some 100 kilometers outside of Goroka town. One of our female staff members had recommended the location. She connected us with the pastor’s son, who asked us to install a device at their church, Foursquare Gospel Church. It was a wet morning when we went to the village for the installation, we met the Pastor on the road to the village and he informed us that his son was waiting for us. When we arrived, the Pastor’s son and some of his boys helped us get on the roof to mount the solar panel. After that we mounted the battery box on the wall next to the pulpit and connected the cable from the solar to charge it. While the boys put up the stickers and the poster, we browsed through the WIFIBible on his (pastor’s son) phone and showed him all the contents and how to download them to his phone. 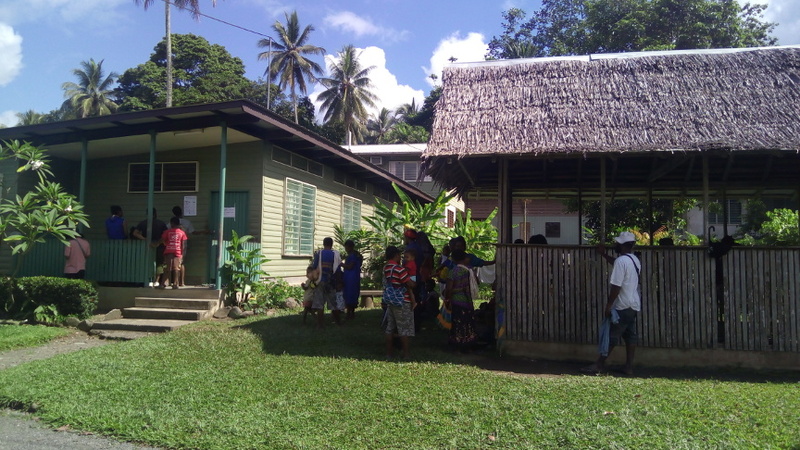 The third installation was at Waritsian village in the Markham area of Lae, Morobe Province. The location was at a Pastor’s house which was along the road going into the village. While his boys helped us with mounting the solar panel on the roof of the house, we put up the battery box inside the house and connected the cable from the solar to power it up. We then connected to the device and went through it with the Pastor and his son. They put up the stickers at the back of the wall facing the road. The poster was pinned up outside the wall next to the door. We had asked EBC Health to partner with us in installing the remaining thirteen solar WIFIBible kits in all their Health Centre Facilities. Most of these centres are located around the remote areas of Jiwaka, Eastern Highlands, Morobe and Madang Provinces. During our last trip down to Lae to pack Bibles for Bougainville, we also prepared the first device for the EBC Health Facility at 6 Mile Lae and two 12 volts WIFIBible for the Highway PMV buses traveling between Lae and Madang. Arriving at the EBC Health office it was already packed with people coming to see the health workers. We informed the workers that we were there to do the installation and they told us that they were aware of us doing the installation and that their main office informed them to ask us to do the installation at their new facility but since it wasn’t opened yet, we installed it at the facility that they were currently using. While we were still mounting the battery box, one of the EBC workers who come around to help us with the ladder, announced to the people waiting outside, about the WIFIBible and what it has on it. 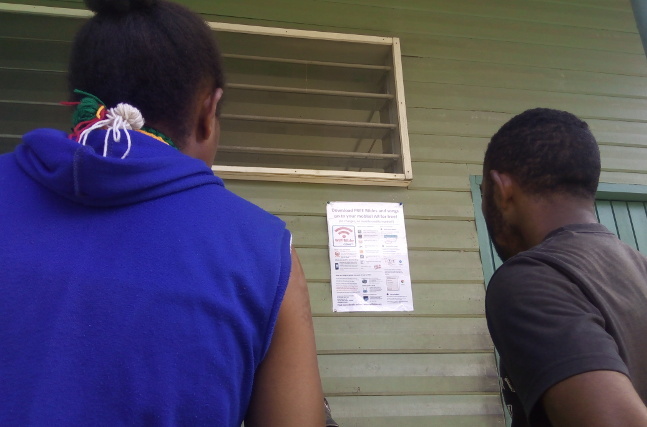 We then gave them a poster to put outside the office and once the poster was up, one of them had already gotten her phone out to check out the WIFIBible while a small crowd of three to four people gathered around to read the poster. 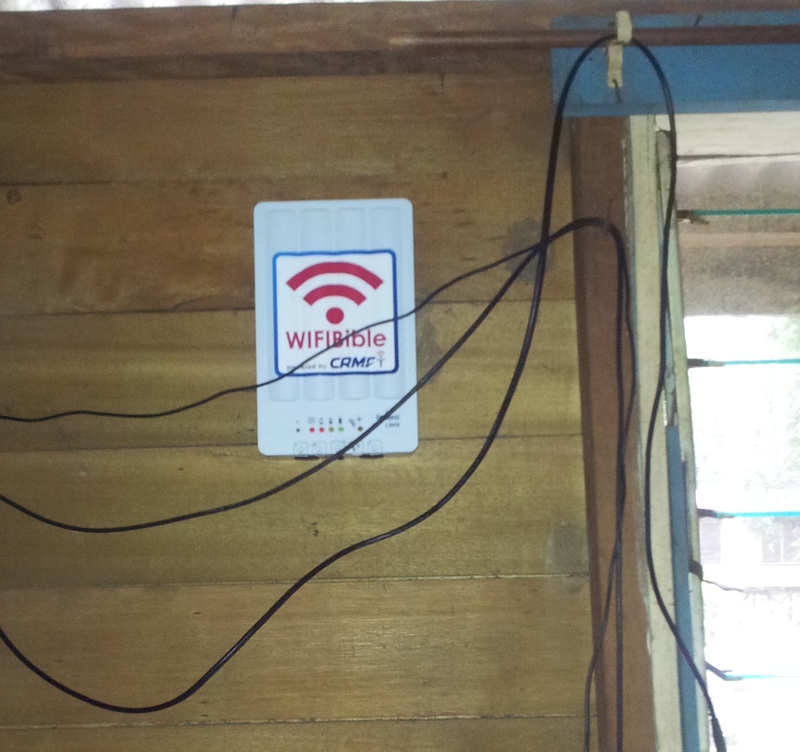 After that we went to the Lae highway bus stop for the two WIFIBible bus installs. One crew approached us thinking that we needed transport. We told him about the WIFIBible and that we are doing a free installation on two highway buses and we needed permission from the bus owner. He was in a hurry and asked for a brochure. Another crew approached us and we told him about the WIFIBible and he brought us to the driver who is also the owner of the bus. We explained to the owner about the WIFIBible and he told us to go ahead and install it while one of his crew filled out his details on the customer form. After that we put up two WIFIBible stickers and gave them the instructions. The bus name was “Yumi Yet Rong”; it travels on the Lae – Hagen – Lae route. 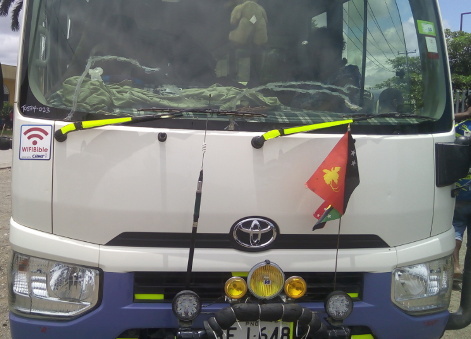 The other crew is from the Damsai Bus, which travelled the Madang – Lae – Madang route. The crew saw us holding the WIFIBible and came over asking what it is. We explained that it’s a device that has biblical contents on it and that you can access from a mobile phone without the use of data and we also told them that we were installing them for free on any highway PMV buses. We needed the permission and details of the owner before doing the installation. He said that the bus driver is the owner’s son. He left us and went to talk with the driver about it. They called us over and told us to go ahead and install it. We explain and informed the driver about how they can use their device to connect and download the contents from the WIFIBible and we also informed him to tell his passengers about it. After that we put up the two WIFIBible stickers on his bus then we gave them further instructions and left the bus stop. We are excitedly planning our next Solar WIFIBible install and praying that all of them have impact in people’s lives.